Health bosses were forced to bring in a doctor who is usually on call for major disasters to cope with problems at an under-pressure A&E department. 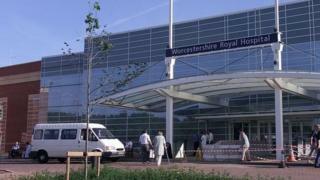 The doctor, known as a medical incident officer, cared for eight patients at Worcestershire Royal Hospital on Friday night. In an "unprecedented" move, West Midlands Ambulance Service demanded action following delays in treatment. The Care Quality Commission said it was monitoring the situation. It was the first time a medical incident officer has been deployed to a hospital in the West Midlands, according to the ambulance service. A spokeswoman for the Royal College of Emergency Medicine said she was not aware of it having happened elsewhere. A West Midlands Ambulance Service spokesman called the decision to send the doctor "unprecedented" and "not taken lightly". An unidentified senior clinical member of staff from the trust said: "The problem at the moment is that the Worcestershire hospital is far too small. They can't cope with the number of admissions or the number of walk-in patients that turn up in A&E. "These things mean we have ended up with a crisis in A&E. "They have now drawn little rectangles into the corridors to signify that is a corridor bed. It's incredibly stressful. It becomes a Third World situation where only the very sickest patients can be treated properly." Patients treated by the medical incident officer included one who had been left for four hours following a seizure and another with a suspected blood clot who had been left in the hands of ambulance staff. Another had been waiting five hours with heart-related chest pain, ambulance staff said. The last time a medical incident officer was called out was when a firework warehouse exploded in Stafford in October. The Care Quality Commission said it was aware that West Midlands Ambulance Service took the action at the weekend and was monitoring the situation. It has already carried out an inspection of the emergency department and said it would report its conclusions soon. The trust said the latest peak over the past two weekends was caused by a 15% increase in blue light ambulance calls, a figure disputed by the ambulance service. Mary Wilkes from Stourport-on-Severn said her 89-year-old very sick husband was taken to the emergency department on Saturday 4 April and was still on a trolley when she left 11 hours later. Her next-door-neighbour, Roger Barry, complained after being left for more than 15 hours on a trolley in February. He said he had not yet received a response to his complaint.